The joint Verizon/Motorola DROID event is already underway, and though most of you will be waiting on details relating to specs, Motorola's Rick Osterloh confirmed a pretty interesting recent rumor: a new display tech called ShatterShield is coming to the DROID Turbo 2. 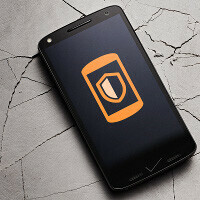 As the name suggests, the idea behind the focused effort, which apparently took some 3 years to yield an actual product, not to mention numerous test fixtures and computer simulations, ShatterShield will supposedly put an end to the shattered screen epidemic. That's a tougher ask than some might expect, though, which is why Motorola is actually using five whole layers with the display stack to ensure that accidental drops won't be followed by tears. The first layer of ShatterShield is a rigid, aluminum core that serves as the foundation of the integrated system, melded together with layer number two: a flexible AMOLED display that will bend instead of shatter upon impact. These two are then joined by what Motorola calls a Dual Layer touchscreen with 'redundancy' (to absorb shock), and an interior and exterior lens covers, the latter of which will supposedly prevent dents and scratches. From what we saw, the screen on the Turbo 2 is indeed well protected, and survived two drops on a slab of concrete brought on stage for the presentation. In all, this sounds like a neat solution, and Motorola didn't miss the chance to point out that it's a world first for the industry. And yes, in case you were wondering, Motorola's other new phone — the DROID Maxx 2 — won't feature the new tech. For once, I agree with those who say Motorola should not have saved the goods for Verizon. A true shatterproof screen is a great idea and shouldn't be limited to one carrier. Bring this kind of tech unlocked and to all carriers, and people will start talking about Motorola again. Now THAT is what one calls 'display tech innovation' and not that gimmicky 3D touch thing. Trust me, it'll still shatter. ssh, don't shatter their dreams. He ain't one. or are you rather? If it works then great, if not then marketing lies. Guaranteed not to crack or shatter, here's hoping that Motorola backs that in full.